Since 1975 hundreds of guests have taken a ride on our Chemin de Fer charity train—the Academy’s largest fundraiser of the year. Held the first Saturday in May, Chemin de Fer is a journey to a fascinating destination—the Kentucky Derby, the Orient, Tuscany, New York City or Paris, to name a few. It’s also an opportunity to win exciting and one-of-a-kind auction prizes, enjoy an elegant sit-down dinner, and visit with Academy parents, alumni, and friends, all while supporting the important work of Sacred Heart education here at the Academy of the Sacred Heart. For further information call (636) 946-5632. This Chemin de Fer guide is provided for our newer parents to answer questions you may have about the Academy of the Sacred Heart’s annual dinner auction and to refresh the memories of our returning parents. Should you need additional information, please contact the Advancement Office, one of the chairs, or check our auction website. Chemin de Fer [shuh-men duh fair] is our annual benefit auction, held this year on May 4. Chemin de Fer, the French word for “railroad,” got its name 45 years ago when a parent of alumni set our fundraising train in motion. The idea of a casino auction was a bold new venture. Chemin de Fer was also the name of a casino game played on the French Riviera. This year Chemin de Fer will be Havana Nights! What was once an evening of casino games and a lavish hors d’oeuvres buffet in the old gymnasium has grown to an event with many live auction items, hundreds of silent auction items in the White Center, and a fabulous sit-down dinner in Rauch Memorial. Chemin de Fer is the Academy’s major fundraiser. Again this year, we are excited that Chemin de Fer guests will participate in the Academy’s bidding experience using OneCause, formally known as BidPal. With the use of OneCause your iPhone/Android smartphone or handheld bidding devices provided on site eliminate paper bid sheets for easy and fun bidding. During registration, guests will receive a text message to their iPhone/Android or a handheld device pre-loaded with every auction item — item description, bid increments, photo and donor information. Guests can browse the silent auction area and view items on their personal OneCause device. Before the auction excitement gets underway, a Mass is offered at 5:00 p.m. in the Shrine for the convenience of our guests and volunteers. The silent auction, located in the White Center, begins at 5:30 p.m. Guests stroll from table to table looking at the variety of items. When you decide to place a bid, simply look up the item on your phone or OneCause device and place a bid. As the auction continues, you will be automatically notified if you have outbid – and, before the auction closes, you can bid again! Our live auction features approximately 35 items and takes place after dinner in Rauch Memorial (the gym). Items will be auctioned from the stage. To bid, simply hold up your paddle number. Spotters will be in the audience to help the auctioneer recognize your bid. How do you get so many items for the auction? Donations, donations and more donations! We have a committee of individuals who solicit local businesses. Each class also solicits a small amount from each family and the room parents select a gift. Groups of parents, such as local neighbors, professionals or employees of one company, also join together and donate auction items. In addition, we hold gift gathering events, the proceeds of which go to Chemin. You may also send in a donation anytime you wish. A donation contract is included on the Chemin de Fer website. Complete the contract and send it to school along with your donation. Feel free to take a peek at our Amazon Wish List that has many preselected items for the auction. All items are greatly appreciated—including any talents or services you can provide! If it is something you would like, more than likely, others will want to bid on it, too! Cash donations are always welcome. All donations are tax deductible. What is April Showers Raffle? each Academy family to sell $25 raffle tickets between April 1st and May 2nd. Families may purchase their April Showers tickets themselves and sell other raffle tickets to family members, friends or co-workers. The winning ticket holder (drawn the night of Chemin de Fer) receives $10,000!! The winner does not need to be present. Be on the lookout later this month for new exciting selling features and incentives! Do I need to organize my own table? You may, but it is not required. We will do our best to honor your request to sit with parents from your child’s class. Smaller parties will be seated together as reservations are received. We are requiring that payment for your group be made in full when sending in your RSVP. We cannot hold seats based on partial payments. You will also be able to purchase your seats on the auction website—coming soon. What do people wear to Chemin? The evening will feature an elegant dinner and decorations. Cocktail attire is suggested. There are several areas in which you can contribute your time and talent. You are sure to find at least one committee that suits your interests. 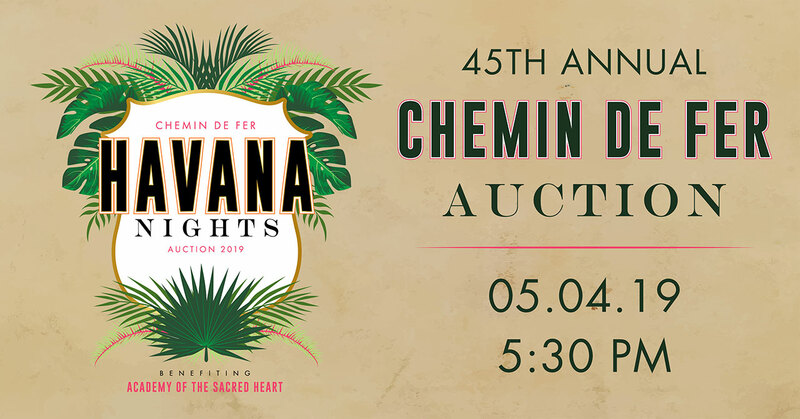 In addition to helping with the preparations of Chemin de Fer, you have the opportunity to serve as an auction volunteer the night of the big event. For more information on how you can support Chemin de Fer please contact Anna Godfrey, agodfrey@ash1818.org. Are there other ways I can show my support? Absolutely! We count on the support of businesses, parents, family and friends to help defray the expenses incurred. A variety of options exists, such as sponsorships and auction program advertising. We hope this helps to explain some of our Chemin lingo. It is a special night that is filled with great food, an open bar and fabulous shopping opportunities. Most importantly, all money raised goes to support the education of our children, and that is cause for celebration!